Spotlight: Marcus Norkaitis - Lead for "Rock of Ages"
PGIA Senior Marcus Norkaitis plays the lead role of Drew in Pistarckle Theater's production of "Rock of Ages." The play is a smash hit and will be adding extra shows to cover audience demands. Marcus, by far the youngest performer, is a big hit with the fans as he portrays a rock star wannabe trying to win the girl. Belting out rock classics including "I Wanna Rock" by Dee Snider and "Waiting for a Girl Like You" by Mick Jones - Marcus and the entire cast are bringing the audience to their feet. Congratulations to Marcus, Director Frank Bartalucci, the entire cast and crew and to Pistarckle Theater. 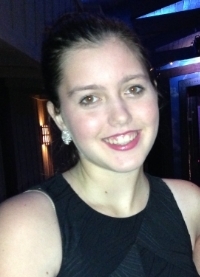 Kudos also to PGIA 9th grader Karen Gauriloff, lighting technician for the production.